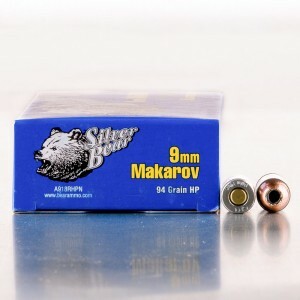 9mm Makarov hollow point ammo is uniquely qualified as a self-defense load. While the round is weaker than most full-sized duty loads, the 9mm Makarov is a capable to protect you and your family in an emergency and is certainly better than throwing stones! The round packs a bit more punch than the popular .380 ACP cartridge and can be chambered in firearms roughly the same dimensions as a 380. So, 9x18 is still small enough for pocket pistols but will lend you a bit more punch. 9mm Makarov has been met with a number of jacketed hollow point (JHP) loads which make an excellent self-defense round. A hollow point is designed to expand and mushroom when it makes contact with a soft target. This creates a larger wound channel and also slows the round enough to reduced the risk of over penetration of a target. 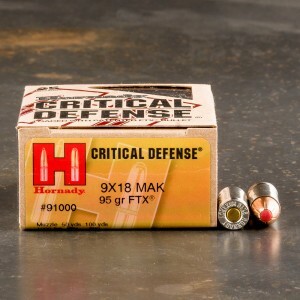 Take a look at all our self-defense 9x18 jacketed hollow point ammo for sale below. All rounds are in-stock and ready to ship to you fast. I have two Polish P-64 pistols, both of them feed and shoot, and eject this load just fine. I have never experienced any problems with this load, and I highly recommend it. Excellent ammo. I highly recommend. My Makarov is my carry gun since the bullet is larger than a .380 and the gun is lighter than most 9 mm. Can't say anything but "perfect"!